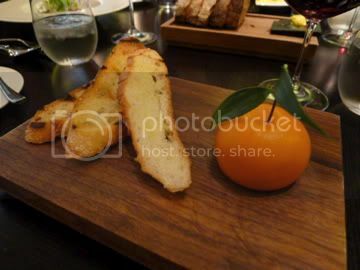 Heston Blumenthal's two restaurants - the legendary classic Fat Duck in Bray and the new Dinner at the Mandarin Oriental London - were on my bucket list for London, and I got to try them both this year. Heston is probably UK's most famous chef and his every culinary and personal move has been covered within an inch of his life. Poor man. Because it's Heston, the punters' expectations sometimes feel impossible to meet. Still, he's an extremely talented and creative man with an obsessive attention to detail, and I enjoyed both meals immensely. It's just food, you know? Everything at the Fat Duck is elaborate, meticulously prepared, and dinner theatre in the fullest sense. It was immensely enjoyable and a once-in-a-lifetime experience. Dinner serves a menu researched from England's medieval dining traditions, with less fanfare but no less tasty. Both menus have been covered within an inch of their lives, praised, criticised and debated. I thought they were exceptional meals and well worth the money. Here're some of my faves. I guess Heston likes porridge and reinventing oat porridge to become savoury was pretty well done. Chinese savoury rice porridge is already one of my favourite things so these were no-brainer favourites for me. 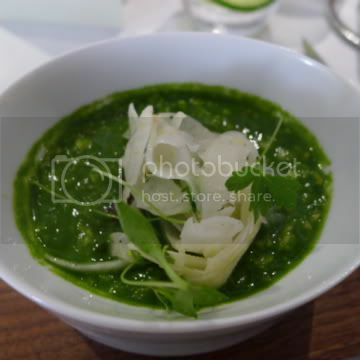 The Snail Porridge (Iberico Bellota Ham, Shaved Fennel) at the Fat Duck (picture below left) is is a famous classic, I suppose because they look like snails in their natural grassy surroundings but they go down a treat. 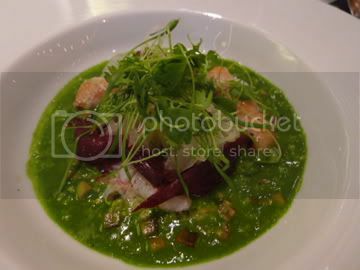 The Savoury Porridge (Snails, Girolles, Garlic and Fennel) at Dinner (below right) is very similar but with slightly less posh ingredients perhaps. But girolles are always gorgeous. Simple perfection. 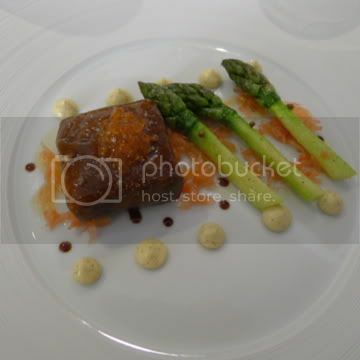 There are a lot more elaborate and clever things on the Fat Duck menu, but one of the best dishes for me was the relatively simple Salmon Poached in a Liquorice Gel (Asparagus, Vanilla Mayonaise and Golden Trout Roe) - (below left). The salmon was sous vide to an unreal consistency that was sublime, and the liquorice gel encasing the fish gave it a slight edge that cut the rich fish taste. Superb. 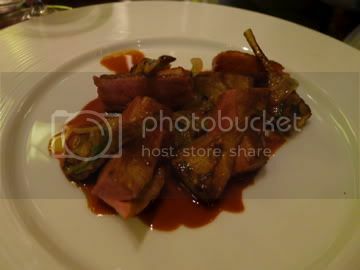 In a similar vein, the Spiced Pigeon (Ale, Artichokes) from Dinner (below right) was lovely, because the pigeon meat was cooked to tender perfection. The texture of both meats really lifted the dishes. 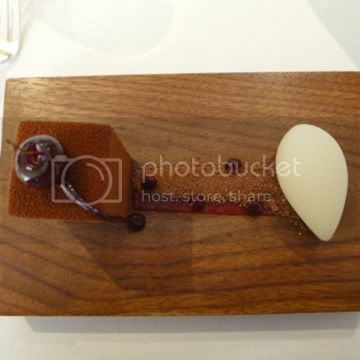 The best dessert at Fat Duck by far, was the BFG (Black Forest Gateau) - (below left). I can't describe it but it was the best chocolate dessert I've ever tasted. 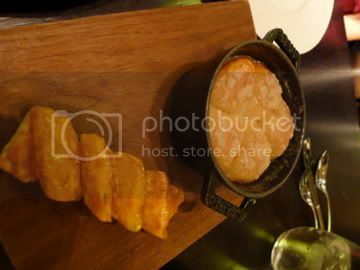 The most talked-about dessert at Dinner was the Tipsy Cake (Spit Roast Pineapple) - (below right), with a slow-caramelised pineapple section that went amazingly with the soft, sweet brioche. It was worth all the hype. Last things to say is if you can hold your liquor, the wine pairing at the Fat Duck was spectacular. 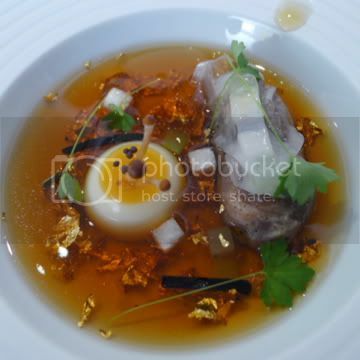 While expensive, every dish was imaginatively paired - sometimes it was the highlight compared to the dish. And while it seems impossible to get a booking at Dinner we found the Sunday night waiting list to be our lucky charm. Enjoy.